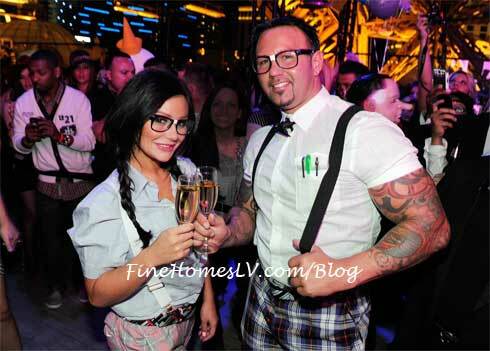 Jenni “JWoww” Farley, celebrated Halloween more so out of style at Chateau Nightclub at Paris Las Vegas Saturday night. The newly engaged “Jersey Shore” reality TV star dressed as a “nerd” wearing thick-framed glasses, suspenders, plaid pants and black Coach high-top sneakers as she arrived to the nightclub. Alongside, fiancé Roger Mathews complemented Farley’s nerd bombing costume sporting a white button up with black suspenders and a bow tie. While hanging out on the red carpet the bubbly brunette showed off her sparkly new diamond ring and talked about her upcoming wedding plans and the future. Farley mentioned that Mathews gave her permission to plan whatever she wants on their big day, as long as she doesn’t turn into a “bridezilla”. The “Jersey Shore” beauty was all smiles, stopping to pose for photographs and chit-chat with admiring fans before making her way onto the lavish rooftop of the nightclub overlooking the Strip under the Eiffel Tower. All eyes were on the dynamic duo who held court with a close group of friends also decked out as nerds, including Ryan Labbe, who sported high waisted plaid pants and oversized glasses. Hundreds of fans screamed with excitement when Farley took to the microphone to wish partygoers a Happy Halloween. The geeky group treated themselves to Grey Goose cocktails and snacked on gummy worms and candy corn, a favorite confectionary of the super sweet starlet. Farley and Mathews couldn’t keep their hands off each other before they were presented with a congratulatory bottle from the nightclub of Dom Perignon for their recent engagement.